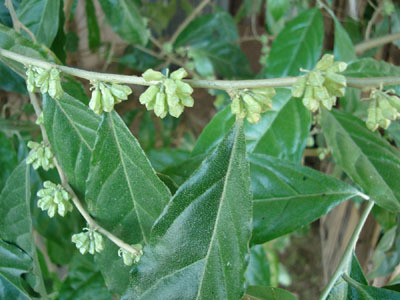 Heiyai is grows wild in the hills of North Eastern States of India. It bears small fruits which are eaten by local people. The fruits are also offered for sale at the local markets. A scandent or straggling woody deciduous shrub; bark darkish grey, splitting vertically, 7 mm thick, blaze first layer dark-brown,and inside red fibrous, young branches densely covered with brown scales. Leaves3.5 by 13 cm, elliptic or elliptic oblong, acuminate, entire or slightly undulate, coriaceous, glabrous above, clothed with pale scattered silvery scale beneath. Flowers 10 – 12 mm long, covered outside with coppery scales, borne in short axillary clusters; buds club shaped, pedicel short, 3-5mm long. Fruit pyriform, 7-10 mm long, yellowish when ripe, covered with coppery scales, endocarp crustaceous, not ribbed, glabrous. The fruits are edible and eaten by local people. 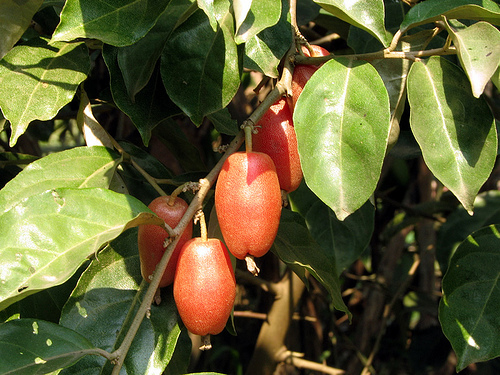 In fact heiyai fruits are very similar to those of soh shang in taste. The external appearance is also same except that the fruits of heiyai are somewhat pear shaped where as those of soh shang are of uniform thickness. Heiyai is relatively frost hardier and can therefore be planted at slightly colder locations where soh shang may not be able to survive. This plant can fix nitrogen in soil. Heiyai can grow in all type of soils if the location is well drained. It will not do well in the shade. New plants can be raised from seed as well as semi-hardwood cuttings.